Call a child by his brother's name or her best friend's name and you'll quickly find out that a name is important! So it is with the church. Jesus died to purchase His church, it is His bride, and it should wear His name! However, we have a world full of religious bodies who choose their own names. The Bible uses a few names for the church: church of Christ (Rom. 16:16), body of Christ (Eph. 4:12), church of the firstborn (Heb. 12:23), and church of God (Acts 20:28). 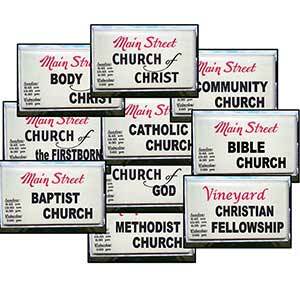 This visual shows a generic Main Street sign with each of those names and a variety of denominational names. Use the signs to guide a discussion of what "church names" are Scriptural and which cannot be used. View Worse than not believing in God? YES! View Put on the whole armor of God! View Just what is the preacher's job?